When I first saw this Beast Saga figure, I didn't know his name. I thought Dacker might be a platypus, but now that I have it in my hands I think it's a regular duck. 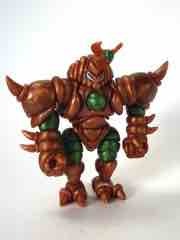 There was a little yellow duck in Battle Beasts too, but this one is a lot more clever. 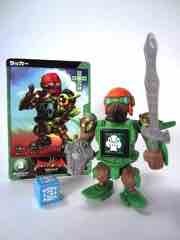 The 3-inch figure not only has armor that looks like a plane, but he's wearing a flight cap and goggles! As the Beast Saga line went on the people at Tomy put a lot more thought into the whole "animals in armor" idea, so we'd get a dog doctor, or an admiral turtle, or a figure that is for all intents and purposes a cyborg Launchpad McQuack. The delivery on the Kabuto Mushi Standard Pearlescent Brown in nothing short of miraculous - on Friday, orders were placed at 7 PM Arizona time. By noonish on Monday, the figures were delivered. I've been through dozens of releases of indie figures over the last few years and usually, at best, things tend to ship out in about a week. To be shipped by Monday would be amazing, but delivered? In a crazy cold snap in which all sorts of mail delays are going on? That takes dedication - but that's just another day at the office for creator Marty "TheGodBeast" Hansen, who has been crafting all sorts of Glyos heads, prototypes, and hand-cast figures for collectors and others for years now. It's rare to see someone with the collector gene, a keen eye for toys, and tons of talent put out a figure like this but here we are! 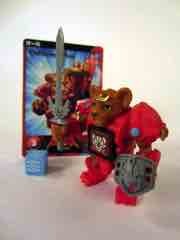 Sometimes a toy line can't surprise you - Beast Saga is one of those lines. If you bought one figure, you know what to expect - it's limiting and liberating all at once, because I knew I'd probably like Ogre before I opened her package. I also knew she wouldn't have new weapons and there would be little to get excited about after opening it - if you don't like how she looks, well, there ain't much here. As a kid, I loved the armadillo. 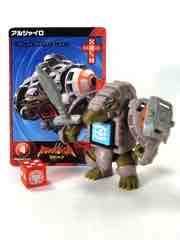 So when Battle Beasts made Armored Armadillo and as a kid, I had to have it. When this line got one as Aljaylo I got it and the clear "Burst" version too. How could I not?